National Defense Transportation Day has been officially observed since 1957, when Congress requested that the President of the United States designate the third Friday of every May as a day to recognize and observe efforts of our military forces in ensuring the safety of American citizens. During times of war, citizens often observe large military convoys snaking along American highways and roads, transporting truckloads of soldiers, equipment, weapons and food to military installations around the country. Since the attack by terrorists on New York City in 2001, the term National Defense Transportation has taken on new meaning. Increased security at border checkpoints, and at military and government installations has been heightened. Increased airport security has hampered the timetables of millions of travelers around the nation, and yet few people seriously complain about the longer waits. Most Americans have adapted when it comes to airport security by arriving earlier for their flights. Extra measures taken by the National Transportation Safety Administration have added restrictions to the amount and types of baggage Americans can now take on board aircraft, but again, most Americans understand the reasoning behind these safety measures. The restriction of certain flights to cross over sensitive military and governmental installations has also served to increase a sense of national security. While many people don’t consider their postal service a transportation service, daily mail is transported across state and national borders on a daily basis. The safeguards adopted in postal offices around the country also serve to increase our security, at home and abroad, so let’s not forget them during National Defense Transportation Day. Such a day is not limited to the movement of howitzers or tanks throughout our nation. It’s a day when Americans from every state should honor and recognize the efforts of military personnel, as well as civilian employees of our national transportation systems who try to ensure that our lives are safe when traveling. Whether we take public transportation or drive our own cars, Americans are protected to the best abilities of those who work in transportation fields. National Defense Transportation Day has been observed since 1957. In 1962, the President of the United States proclaimed the third Friday of every May as a day to recognize the efforts of those in the transportation industry to serve and protect our nation’s travelers. Without transportation, America would come to a screeching halt. The next time you have to display identification to drive through a border check or other checkpoint, or have to wait while a large convoy of military vehicles slowly winds its way down the road into the distance, try to be patient and realize that Americans charged with your safety are doing the best they can to serve and protect your needs, and your lives. 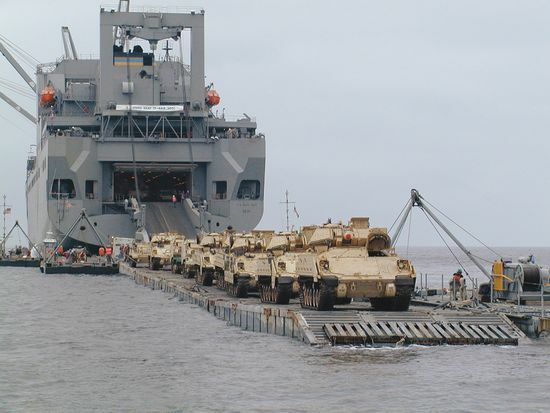 National Defense Transportation Day is a day when the military takes to the roads of America as they practice maneuvers and transport vehicles from one military base to another. Military exercises are held, and on occasion, parades displaying military vehicles, weapons, airplanes and helicopters are on public display. Whether the day offers displays of military might or a lone officer standing at a checkpoint asking for identification, National Defense Transportation Day is a day to be recognized and honored by all Americans for its attempt to keep each and every one of us safe and secure in our own country.